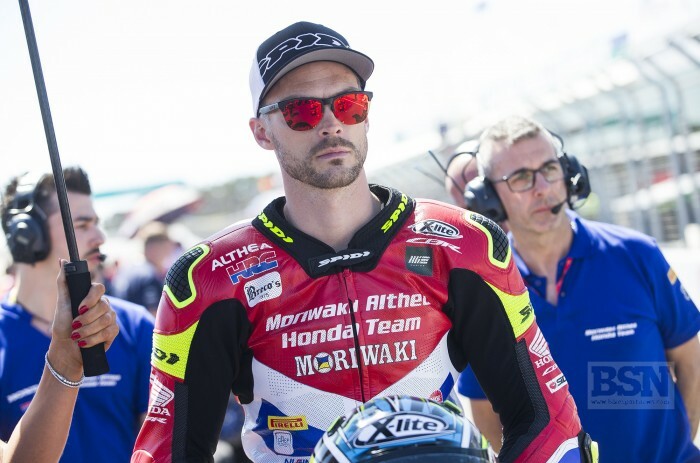 Moriwaki Honda’s Leon Camier will undergo treatment on a knee injury suffered during today’s WorldSBK sprint race that has done nothing to help his difficulties this year. Camier and the HRC-run Fireblade haven’t progressed much further than this time last year and even at a circuit where they had done their pre-season testing, the team found it a real challenge, with Camier 13th out of 17 finishers. After one and a bit rounds Camier is resigned to the fact that things may be much the same for some time. “I think a top ten is where we are at realistically,” he stated even on Friday in Buriram. Even then realistically I think it is going to be difficult to be top ten. “There are some areas we can still improve, but there are some areas that we are limited. We had a test here, but this is where we are at. We have to work on speed for sure, top speed is not so bad, but we are still 12kmph down on Alvaro. Given that the new Ducati is now above even the best Kawasaki and Yamahas, Camier agreed with the point made by the media that maybe a new model will be needed soon anyway. “It would be better I think,” he said. “For sure this bike is old, but there is some potential in some places to be OK. Bit to be winning or at the front pushing for a podium is very, very difficult. Lap times are so much faster than last year. And you have so many fast bikes. “If you look at the lap times this year compared to last year, just here for example they are so much faster. You have four Yamahas of the same spec. Four Ducatis. OK Laverty’s one is probably going its own way, but at this point it is similar. Two Kawasaki, and Sykes with a BMW that seems to be strong. There are so many fast riders on fast bikes that if you are If you are a couple of tenths off then you are back there. And if you do not qualify at the front, unless you have an advantage, you can’t race at the front. If they all pass you down the straight then you are another place back, and another place back, because someone else comes past. “Every aspect of the bike has to be working right. With every aspect there is no breathing space there are many riders not that are capable of being in that top six, especially top ten. So it just makes the little details even more important.